Let’s face it: we will be hosting more people on Thursday than any other day throughout the year. Therefore, none of us have a complete set of chairs or place settings to accommodate the surge! 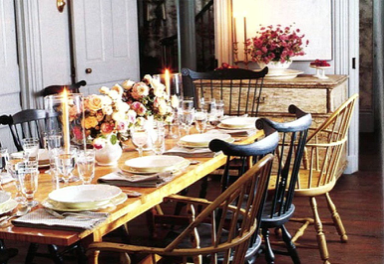 Don’t fret, mixing and matching various chairs can add a touch of home and warmth to your Thanksgiving tablescape. Personalizing an item for each guest is a great way to make them feel at home and welcome. Use this DIY project to accomplish just that! 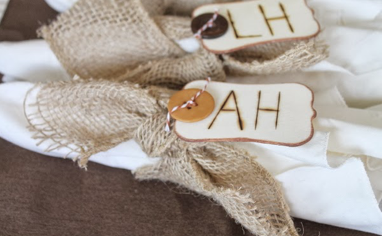 All you need are some gift tags, buttons, wires, and burlap strips to create these personalized napkin rings! It turns out, the mason jar is useful for more than just jarring grandmother’s jams! Take a look at this creative, low-cost centerpiece. All you need are glass mason jars, strips of burlap, twine, and cardboard or wood letters. You can fill the bottom of the jars with candy corn, coffee beans, or even fall foliage! Foods at Thanksgiving are equally as beautiful as they are delicious! Utilizing vibrant pumpkins or cranberries in you decorating allow for playful interaction between what’s on your plate and what’s decorating your table! Make sure you do not forget to continue your decorating into the guest bathroom! 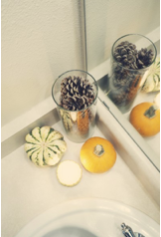 Simple accents like mini pumpkins, tea-light candles, and acorns make a great compliment to any powder room decor! Can your entertaining spaces handle hosting?